We offer the best Alaska salmon fishing vacation that you can imagine. The Alaska Sportsman’s Lodges are known for our premier fishing packages that are full-service and full-adventure. Expert fishing guides from around the world line up to get the chance to serve as a guide at one of our two lodges. 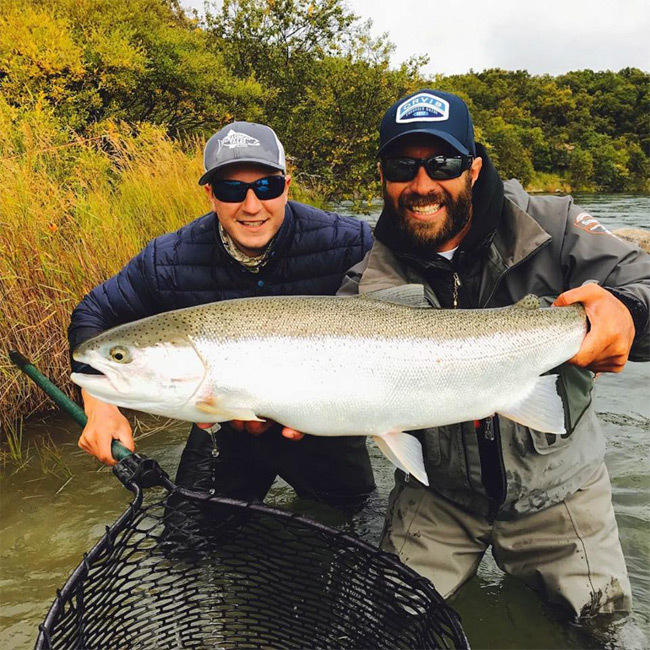 The expertise of our guides, the rustic luxury of our lodges, and our 5 star service guarantees that we will provide an Alaska salmon fishing vacation that you will never forget. Our lodges are located on two of the most famous sport fishing rivers in the world: the Naknek and Kvichak Rivers. We strategically placed our luxury lodges on areas of these rivers that are absolutely bursting with fish! We know that you will return home from your fishing vacation with armloads of bright pink and delicious salmon. Both of the Alaskan Sportsman’s Lodges offer full-service fishing packages. A typical fishing day at one of our lodges is amazing to say the least. Each of our guests can enjoy a fishing vacation that is tailored to their own desires. Once you arrive at the lodge, you and our expert fishing manager will meet to discuss the type of fishing that you would like to experience during your stay. Every evening, our expert fishing guides, pilots, and fishing managers meet to discuss the next day’s expected weather conditions and decide which rivers will be the best places to fish. Therefore, our guests can rest assured that they are fishing in the most premier and lucrative locations each and every day of their visit. One of the amazing things about each of the Alaskan Sportsman’s Lodges that makes them so unique from other Alaska fishing lodges and programs is that fishing on our ‘home waters’ are just as successful as fishing on one of our ‘fly-out’ expeditions. Our guests are pulling just as much salmon out of the waters within sight of the lodge as they would be in a distant fly-out destination river. We GUARANTEE that you will never find this at any other lodge. Most other fishing programs actually require that you fly out every day, regardless of the weather. They do this simply because there is just no fish in their ‘home rivers’! Our guests love the fact that they are in control of their own fishing experiences during their stay at our lodge. They can choose to stick around the lodge, or fly out into the Alaskan wilderness. It doesn’t matter! Our lodges are so remotely located that giant salmon and Rainbow Trout will be nipping at their toes no matter where they toss a line.